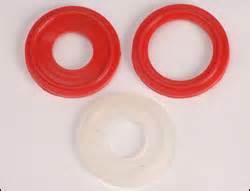 Silicone: Silicone brewery gaskets have a very wide temperature range of -58ºF to 446ºF making them suitable for a wide range of applications and great for home brewing locations where they will be near flame or in heat wash. They are very flexible and relatively soft making them easy to work with and seal. They can get gummy over time when used with strong acids and caustics in commercial applications. Silicone brewery gaskets are translucent clear. EPDM: EPDM brewery gaskets have a narrower temperature range than silicone (-30ºF to 300ºF) but stand up to stronger acids and caustics than silicone making them more desirable in commercial applications and excellent for home brewery applications. EPDM brewery gaskets are relatively soft, easy to seal and probably the best all around choice for any application that doesn't need to live close to a flame source. EPDM brewery gaskets are black. PTFE: PTFE Teflon brewery gaskets have the widest temperature range (-100ºF to 500ºF) and are also the hardest making them ideal for locations that need to rotate against each other like racking arms. (Never rotate or loosen a connection that is holding back hot liquid!) Being hard, they are somewhat more difficult to get a good seal. PTFE brewery gaskets are solid white. BUNA-N: BUNA-N brewery gaskets have a fairly narrow temperature range (-30ºF to 200ºF) but remain flexible across that range and seal well. They do not do well with acid (Star-San is fine) or caustic cleaners and should be kept away from UV light where they can oxidize. BUNA-N brewery gaskets are a good choice for the fermentation side of a brewery where their low cost makes them nearly disposable. Black in color.